abounds in the ring!! Ladies this is YOUR corner...submit your poetry and your writings. 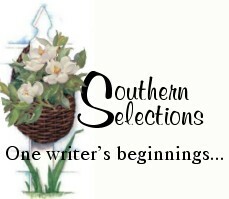 Selections" We look forward to next month's submissions!! Enjoy these next few selections. Visit the homepages and learn more about your Southern Sisters!! You may like to watch T.V. I woke up to on Saturday morn. yet built to enfold you. Sweltering heat rising from the bubbling blacktop; popping like pop corn in a vat of oil. Tender feet hopping on one leg to get to the other side. cooling your dusty feet and making them whole again. A cattle guard to skip across, a flattened rock picked up to toss. A rope swing stirring in the noon day sun; waiting for children, waiting for fun. An old collie dog born with no tail, slowly making his way up the trail. Supper time comes around a table of grace nothing fancy, no trim or lace. Heads bent, folded hands, praying for rain from the promised land. Crickets chirp, fire flies fly, kiss good night, feather beds to lie. 8. THE SMELL OF A SMALL CHILDS NECK. 9. THE SMELL OF YOUR LOVER'S SWEAT. 20. THE SIGHT OF SIGHT. 21. THE SOUND OF YOUR CHILD'S LAUGHTER. 23. THE SOUND OF A WHIPPERWILL. 30. THE SOUND OF SILENCE. 40. THE TASTE OF LIFE.